It’s a rollercoaster. No, it really is. We’ve been in Disneyland Paris for the last few days, and I’m writing this on the ferry back home, feeling like I need another holiday to recover. 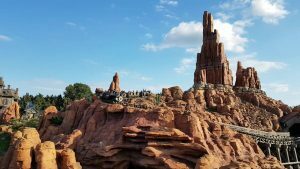 Our favourite ride – I lost count of the number of times we queued for it – was Big Thunder Mountain, a rollercoaster pretending to be an out-of-control mining train in the Wild West. Perfectly designed to give you an experience just on the exhilarating side of terrifying. As I’ve got older I’ve found myself more ambivalent about rollercoasters: mostly I still enjoy them, but sometimes the sense of being out of control makes me feel panicky, and instead of having fun I’m just holding on praying for it to be over. So on Day 2 I made a conscious choice as I sat clutching the safety bar at the start of each new ride: go with it. I’m choosing to ride, so I’ll choose to enjoy the experience. And I did. Moments of pure exhilaration are rare these days, and the sensation of hurtling round Big Thunder Mountain with my arms in the air – blue skies above, the lake and the towers and turrets of Disneyland around, and my family screaming happily along beside me – is one I’ll treasure. Back to running my own show tomorrow, but just for a few days I thoroughly enjoyed being a passenger (and I learned a few business lessons along the way…. ).